Unless you live alone you’ll find that no matter how organised you are, it’s others that seem to mess with your system in the kitchen. 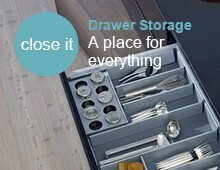 We all have our own ways, we know where we like to store our crockery and cutlery but sometimes, the organisation of this can be out of our control. Some people dislike the thought of others being let loose in their kitchen, while others feel grateful for the help but know it will take time to reorganise everything. Whether it’s a well-meaning friend putting your dishes in the wrong place or a lazy teenager simply shoving clean cutlery in the closest drawer, you can retain control even when you’re not there. Before you dish out instructions though, take a look at the functionality of your kitchen. 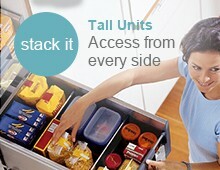 Your cupboards are probably full to the limits but is everything in the right place? The majority of us choose the homes for our pots and pans within the first few days of moving into a home. Despite small inconveniences, many of us will stick with this layout for decades or until we move. 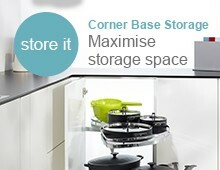 Take a fresh look at your kitchen storage, could anything work a little better? How far do you travel when emptying plates from the dishwasher? 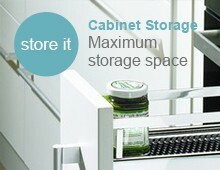 Could you benefit from using a cupboard that’s closer? Do you spend precious minutes rooting around in the back of certain cupboards for pan lids, Tupperware, cake tins? 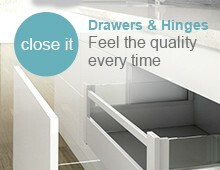 Is there anything in your “close to hand” cupboards that you only use once a month? If there is, or even on your counter tops, consider moving it out of reach or even out of the room itself. Consider the triangle too. The triangle involves the sink (or dishwasher), the fridge and the cooker. Most activity happens in this Kitchen Bermuda zone and so the items you use the most should be stored in the cupboards that fall into this space. Once you’ve organised your kitchen, de-cluttered and made sure there is enough space for all items, you can then put together a plan. With a clutter free kitchen, everything should now have a home. 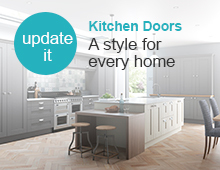 You can drive this message home by writing lists to go on the inside of the cupboard doors. If you have children whom you are encouraging to help around the house, the lists can go on the exterior (as long as you’re happy with the aesthetics of it). Choose where each item will live. This may sound a little like overkill but if you don’t stipulate this, kitchenware will be simply shoved in the cupboard and you’ll soon be wasting time wading through it again. Maximise the available space with clever magic corner carousels or pull out larder drawers which enable you to see the contents at a glance. You’ll be amazed at just how much time this method of decluttering frees up. Although you may be met with a little resistance at first from children, or a little teasing from friends, you’ll soon find they adopt the same system in their own kitchens.